In July of 2009, the City of Toronto Transportation Services division received funding through the Recreation Infrastructure Canada (RInC) Program in Ontario and the Ontario Recreation Program for the purpose of developing multi-use trails across the city’s hydro and rail corridors. The projects—to be managed jointly between Transportation Services and Parks, Forestry & Recreation—intend to connect with the larger Bikeway Network which combines all forms of commuter and recreational cycling routes. The RInC funding, finalized in October 2011, was earmarked to upgrade and develop new multi-use trails. A total of seven projects add 30 km new and 4 km upgraded off-road bike trails, spanning the Finch Hydro Corridor, Gatineau Hydro Corridor, and former rail corridors CN Leaside and Scarborough Pit Spur. Toronto City Council approved the installation of 13 new traffic signals, 20 upgraded signals and five road alterations to enhance the projects. The plans represent a 20 per cent increase in Toronto’s off-road trails, and the largest overall bike network expansion in a one year period. 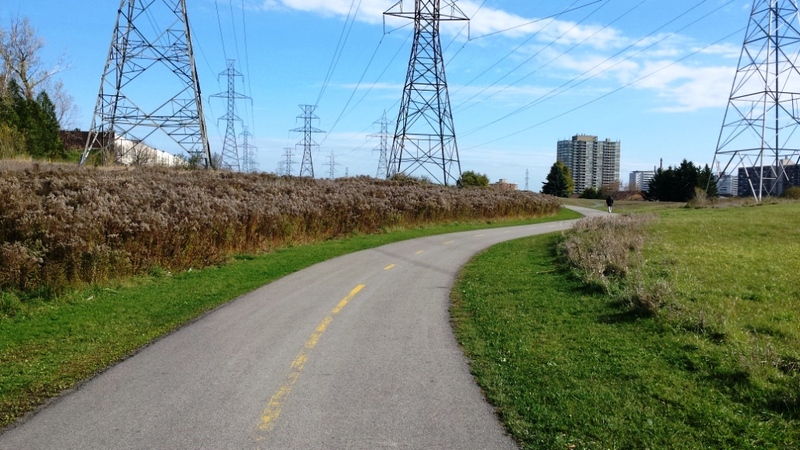 I took a ride one brisk autumn day to check out the Finch corridor in the flesh, or asphalt, and asked the local councillor how this off-road trail benefits the community. The planned Finch Hydro Corridor extension indicated by the dotted line. Map courtesy of the City of Toronto. 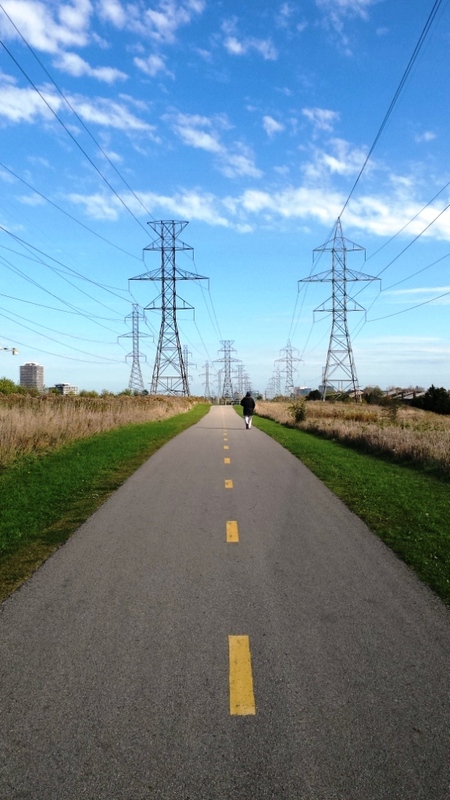 My ride on and between the completed sections of the Finch Hydro Corridor trail went from Wilmington Avenue (east of Dufferin) to Maxome Ave (west of Bayview). The section heading east from Wilmington and ending just before Yonge is extremely pleasant, offering striking visuals through the hydro fields and smooth-yet-hilly terrain. While there are several useful and well-marked access points from residential streets, the entry point of the trail from Wilmington is somewhat inconspicuous and would benefit from more prominent signage. There are several excellent intersections from a cycling standpoint (Bathurst, Willowdale, Grantbrook), with dedicated traffic signals, right-of- ways and pavement markings that help guide riders along the route. Unfortunately, this comes to an abrupt end at Yonge Street where the large Finch station complex interrupts the off-road flow. There is about a 1 km detour, without much directing signage, that cyclists must navigate on shared roads toward Willowdale. From there, a short completed section ends at Maxome, where construction is in progress on the section extending to just before Bayview. 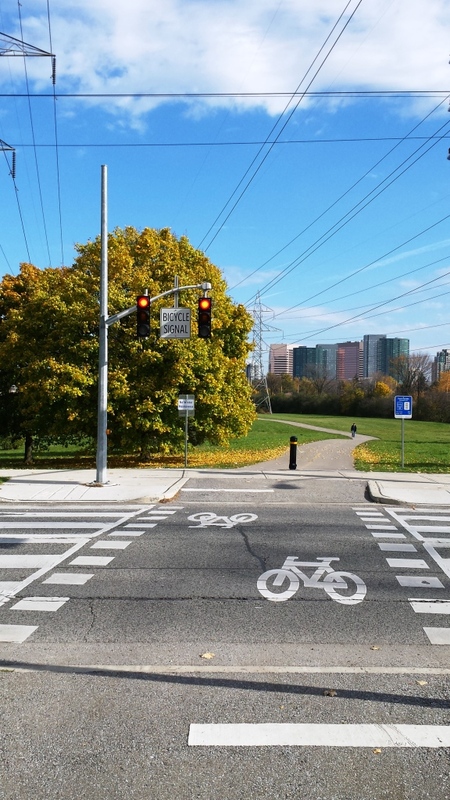 A dedicated bicycle crossing helps link trail sections at Grantbrook St., west of Yonge. dandyhorse had a chance to ask Toronto City Councillor David Shiner about the Finch Corridor Trail Project, and the section currently under construction in his Ward 24 Willowdale. A picturesque stretch shows how the corridor bisects residential neighbourhoods, while also joining them from east to west. DH: How do you see the Finch Corridor Trail benefitting your ward and the surrounding neighbourhoods? Can it help connect existing or upcoming bike infrastructure? DS: I am a big supporter of the trail through the Finch Hydro Corridor. It allows for cyclists to have safe passage through the area and it opens up the corridor to the community. The trail leads to the Bayview Arena with its skate and BMX park and new dog park, and it connects to the trails in the East Don River Ravine system. When do you expect the section extending east from Maxome towards Bayview to be completed? 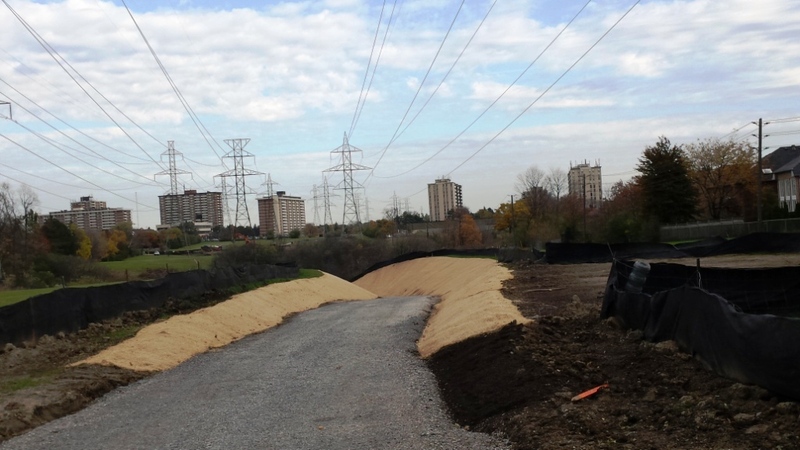 City staff are continuing with their work on the section from Maxome towards Bayview and are cooperating with the Toronto and Region Conservation Authority to complete the final portions of that stretch for the upcoming spring. Are there any specific connection points or intersections that you think need improvement? I have also asked City staff to explore our options and find a safe way for the trail users to cross at the Finch Subway Station. Do you see cycling infrastructure and pedestrian realm improvements as a priority going forward, particularly in areas of North York where cars dominate transportation? Our trails are a tremendous asset for the people of Willowdale. They create important new options for recreation and transit throughout the community. I supported their construction and advocated for the connections to our existing trails in the East Don Ravine Trail System, which I also had the City complete a number of years ago. I have also supported our younger and recreational riders with the construction of North York's first BMX Park. How was this project initiated? Was it difficult to implement? In constructing these projects and securing approvals or funds, the City does face challenges. Things like the weather, contractors, multiple stakeholders and other levels of government can all present unique challenges, however I work with City staff and am able to use my experience to move things forward. The section under construction beginning at Maxome Ave. heading east. dandyhorse will continue our series of interviews with councillors in the coming weeks. Stay tuned for our winter cyclist series too!